At 10:51hr on Saturday 28th July 2018, Seahouses Lifeboat Station was in the middle of a crew recruitment day, when their call-out pagers interrupted the event, and the crew had to quickly go into action. 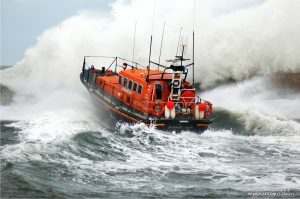 UK Coastguard requested the launch of Seahouses All Weather Lifeboat, to try and locate a distress beacon (EPIRB), transmitting in the Beadnell Bay Area. The Lifeboat is equipped with radio direction finding equipment. At this stage it was not known if this was a genuine or accidental operation of the beacon on a vessel. The All Weather Lifeboat was launched, and prospective crew members were able to witness the call out first hand, in less than pleasant sea conditions ! As the lifeboat arrived at Beadnell and began a search, the local shore based Coastguard Team were on the beach and located a vessel on the beach which was the source of the alert. It was an accidental operation. The Lifeboat was then stood down and returned to station. It was refuelled and ready for service again at 13:05hr that day.